Berlin's public transportation is comprehensive and covers all corners of this sprawling city. It takes you over, under and through Berlin and connects travelers to greater Germany and beyond. The all-inclusive system consists of U-Bahn, S-Bahn, buses, and trams. It's run primarily by the media-savvy Berliner Verkehrsbetriebe or BVG (pronounced beh-fow-gey). A single ticket grants access to an array of transport options and most people use several modes of public transport on any given day. Almost 1.5 million people ride Berlin public transport every day. Though the system is well-organized, spacious, safe, and fairly punctual, it's massive and takes practice to understand. Use our complete guide to Berlin's public transportation to navigate the capital city. The U-Bahn (underground) operates mostly below ground within Berlin city limits (AB zone). The first stations opened in 1902 and have operated consistently with periodic closures, improvements and expansions. An illuminated "U" marks the entrance with the station name in a variety of traditional scripts. Enter the platform and once you have a ticket (bought from a machine on the platform or BVG distributor), stamp it and board your U-Bahn. Maps are present on the platform, with electronic boards notifying travelers of the next trains and estimated arrival. The U-Bahn contains over 170 stations in 10 lines, including the famed U2 line (not associated with the band). The bright yellow cars and colorful stations provide plenty of material for instagram-lovers. U1 (Warschauer to Uhlandstraße): This line includes many of the oldest stations and travels from near East Side Gallery in Friedrichshain through Kreuzberg to Wilmersdorf in the west. U2 (Pankow to Ruhleben): This long line runs south to Alexanderplatz, then west through major destinations. U3 (Nollendorfplatz to Krumme Lanke): Beginning in Schöneberg, this line continues out to one of the most popular lakes. U4 (Nollendorfplatz to Innsbrucker Platz): One of the shortest lines stays within Schöneberg, touching on Tempelhof. U5 (Hönow to Alexanderplatz): Begins in a village in Brandenburg and runs to the center of the city. Eventually it will connect to the U55. U55 (Brandenburger Tor to Hauptbahnhof): The shortest line connects only three stations between popular tourist points like the Brandenburg Gate and main train station. U6 (Alt-Tegel to Alt-Mariendorf): Connects the charming town of Tegel near the airport in the north to Alt-Mariendorf in the south. U7 (Rathaus Spandau to Rudow): Snakes its way through the city from the west to southeast. U8 (Wittenau to Harmannstrasse): Runs north to south from Reinickendorf/Wedding to Neukölln. U9 (Osloer to Rathaus Steglitz): Another north to south line. Major transfer hubs include Alexanderplatz, Nollendorfplatz, Zoologisher Garten, and Friedrichstrasse. Berlin's U-Bahn runs from 5:00 a.m. till 1:00 a.m. on weekdays. On weekends and public holidays there is 24 hour service with reduced frequency. It runs every 3 to 5 minutes within the city center. The U-Bahn runs every 10 to 20 minutes after 8 p.m. with night buses taking over at night. The city's S-Bahn or Stadtbahn (city train) is the local rail which runs primarily above ground. Distance between stations is greater than the U-Bahn and it is the quickest way to travel the city and to the outskirts like Potsdam and Wannsee. Unlike most of Berlin's transport, the S-Bahn is operated by Deutsche Bahn (German rail company). The same tickets offer access to the S-Bahn as the rest of Berlin's public transport. S-Bahn stations can be identified by the green and white "S" symbol. Enter the platform without barrier and once you have a ticket, stamp it and board the S-Bahn. Maps are available on the platform and electronic boards provide info on the next arrival. The S-Bahn covers 15 lines with almost 170 train stations. S41 & S42: The Ringbahn (circular railway) encircles the city center and carries 400,000 passengers a day. The S41 travels clockwise, while the S42 goes counter-clockwise. It stops at 27 stations and it takes about 60 minutes to circle the city. Major crossing points are Gesundbrunnen in the north, Ostkruez in the east, Sudkreuz in the south, and Westkruez in the west. S5, S7 and S75: Busy lines running from west to east between Westkreuz (west cross) and Ostkreuz (east cross). 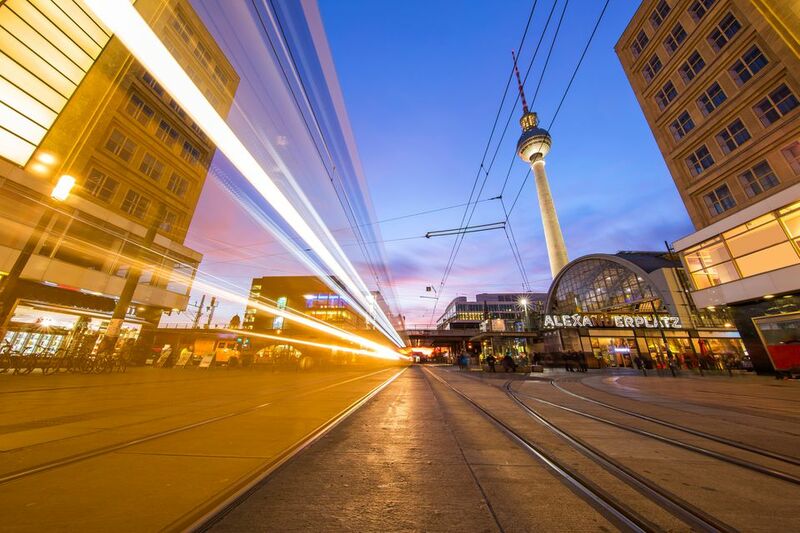 The most visited stations are between Zoologisher Garten and Alexanderplatz where there are plenty of tourists sights like the Siegessäule (Victory Column) within the Tiergarten, Museuminsel (Museum Island) and Hackescher Markt. S1, S2 & S25: Main north-south-lines. The S1 runs between Oranienburg and Wannsee, S2 between Bernau and Blankenfelde, and S25 from Teltow to Hennigsdorf. During the week, the S-Bahn runs from 4:30 a.m. until 1:30 a.m. On weekends and holidays it runs 24 hours a day. Trains run at least every 10 minutes, with frequency slowing to 10 and 20 minutes outside of peak hours and every 30 minutes at night. Berlin's buses add even greater coverage to the city's already impressive network. Though a slower mode of transport, Berlin buses minimize walking in this rambling city. They can also be a great way to tour the city as many travel right by top sights and provide exceptional views from their double-decker levels. Buses are more common in former West Berlin as they "modernized" by tearing out earlier tram lines. Bus stops are marked by a circular sign with a green "H". They often have a small shelter and electronic sign updating on arrivals, as well as a posted regular schedules and routes. Tickets are purchased from machines at S- or U-Bahns, BVG ticket-sellers, or directly from bus drivers. If you have an undated ticket, stamp it with the machine near the entrance. There are more than 350 routes and over 2,634 bus stops. ExpressBus is a rapid or express bus service with fewer stops marked by an X. There is ExpressBus service to/from both Berlin airports (X7 for Schönefeld and X9 for Tegel). Mostly in former East Berlin, trams travel at street-level, winding their way throughout the city. Tickets can be purchased beforehand or at machines on the train. MetroNetz, marked with a "M", offer higher frequency service (about every 10 minutes) and operate 24 hours a day. At night, trams run every 30 minutes. Regular tickets cost 2.80 euros and allow for travel on all forms of transport. They are valid for 2 hours with unlimited transfers in one direction. For example, you can travel around the city on a single ticket for 120 minutes from the time the ticket was stamped/purchased, but you can't go in one direction then come back the same way. Children under 6 do not need tickets and reduced fare is available for children 6 to 14. Fares are subject to length of your trip and which zones you travel. The city is divided into zones A, B, and C. Most of the city is in the A and B zone. A is inside the ringbahn, B just outside, and C up to 15 kilometers (9 miles) around Berlin. Regular tickets include the A and B zone, but you can buy ABC tickets (usually only necessary if you are going to Schönefeld Airport or Potsdam). You can also buy an AB pass and get a C extension if you are taking a single trip to the C zone. You must be in possession of a valid ticket on public transport and it's largely on the honor system. However, you need to show a ticket when entering buses and when ticket controllers — both uniformed and plain clothes — ask to see your ticket by saying "Fahrscheine, bitte" (Ticket, please). If caught without a ticket, you are subject to a 60 euro fine and controllers are infamously unsympathetic. Use the BVG website to plan your trip and find real-time departure/arrival information. Berlin Welcome Card: This tourist ticket offers access to transport and discounts on attractions from 48 hours to 6 days. Tageskarte: Day passes for 7 euros (AB zone) are available for unlimited travel from time of purchase until 3:00 a.m. the next day. Up to three children (6 to 14) are included in the ticket. Wochenkarte: There are weekly (30 euros) and Monatskarte (monthly) tickets (81 euros). A major advantage for these tickets are they allow you to take 1 adult and 3 children under 15 with you after 8 p.m. Monday-Friday and all day on weekends. 10-Uhr-Karte: An alternative to the regular monthly ticket is the 10 a.m. ticket. It costs 59 euros and allows for unlimited travel after 10 a.m. Note that you cannot take additional passengers with you. Kurzstrecke: For three (or less) stops on S-Bahn or U-Bahns, or six stops on buses and trams with no transfers, buy a short trip ticket for 1.70 euros. Fahrradkarte: You can take your bike on S-Bahn, U-Bahn or tram (not bus) but you must buy a ticket for 1.90 euros. For more ticket options, refer to the BVG's ticket site. Entrance to the U-Bahn and S-Bahn is barrier-free and escalators and elevators service many stations - but not all. Maps indicate accessibility. Newer trains offer level-entry boarding with a gap of no more than 2 inches between train and platform. A ramp (manually set-up by the conductor) can be provided. Look for doors marked with wheelchairs/strollers to mark the best cars for wheeled travelers (for example, second door on the bus). BVG offers information for riders with disabilities. Ferries: Berlin is the land of lakes and there are several ferries included in public transport marked with an F.
Bikes: Biking is one of the best ways to travel around this exceptionally flat city. Second-hand bikes are inexpensive, although you should also get a receipt as bike theft is rampant. If you need a bike briefly, use one of the many bike-sharing programs. Helmets are not required and bike lanes are plentiful. Taxis: Taxis are available throughout the city at taxi stands, airport and train stations or by reserving ahead. Taxis are cream with a “TAXI” roof sign. A Kurzstrecke options allows for short trips of up to 2 kilometers at a flat rate of 5 euros, while longer journeys are 2 euros per kilometer (up to 7 km, or 1.50 euro per km after that). Car Rentals: Renting a car is not recommended for travel within Berlin, but can be helpful if traveling around the country and sampling the world famous Autobahn. Refer to our full guide on car rentals in Germany.